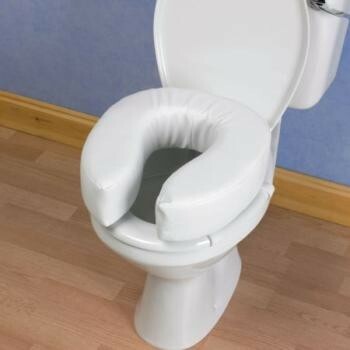 A soft cushion that attaches to the existing toilet seat to provide extra comfort and to raise the effective seat height. The cushion simply attaches with four hook and loop straps. A soft cushion that attaches to the existing toilet seat to provide extra comfort and to raise the effective seat height. The cushion simply attaches with four hook and loop straps. The white vinyl covering protects the cushion and is easily cleaned. Available in two heights.